Size: Adult--1", larva--1" to 1 1/2"
Identification: Adults are beautiful, narrow-winged black- and red-bodied moths that look like wasps. Eggs are brown, flat, oval, and singly laid on stems. Larvae are white caterpillars with brown heads. Biology and life cycle: Larvae tunnel into the base of vine stems, feed for four to six weeks, and cause the entire plant to wilt and die. They hibernate as larvae or pupae in cocoons about an inch deep in the soil. One or two generations a year. Feeding habits: Larvae (borers) enter the base of the stem in early summer, causing a greenish frass, and leading to wilting, and death. They will also feed on fruit of cucumbers, gourds, melons, pumpkins, and squash. Economic importance: Destruction of squash plants. Vine borer eggs. Small little red dots. Natural control: Plant more than just a few plants. Plant early and promote vigorous growth. 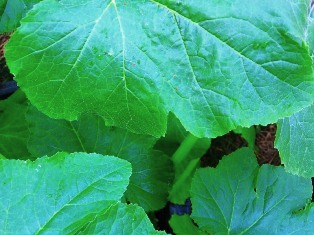 Plant cucurbits with more solid stems, such as butternut and winter squash. Beneficial nematodes. Organic control: Slit the stem and remove the borer. Pile soil over the damaged stalk. Some say injecting Bacillus thuringiensis or beneficial nematodes in the stalk with a syringe works. Both methods are a lot of trouble. Cover plants with floating row cover, but remove when the female flowers start to form. Spray plants with a Bt product when yellow flowers first bloom. Check the base of stems often to remove the reddish eggs before they hatch. Treat soil with beneficial nematodes. 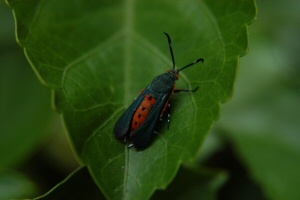 Insight: Squash vine borers tend to avoid big squash farms but destroy home gardens, so plant more plants. Squash bugs were discussed, (Sat. 6-18) on your show. My tip has not been mentioned, to my knowledge. Periodically, I would check the underside of the leaves, and if eggs are found I use masking tape, and lightly pressing against the eggs to get them to transfer from the leaf to the tape, then just fold the tape over and squeeze to mash the eggs, then throw in the trash. Trying to remove the eggs otherwise would damage the leaf. Masking tape is not that sticky and seemed perfectly suited to the task.